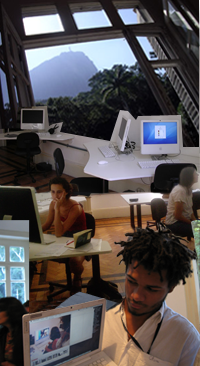 The Art and Technology Center (NAT_EAV) is a teaching, production and research laboratory that operates at the juncture between art and communication technology, particularly virtual networks and mobile media. It was set up in 1998 by a group of teachers from EAV (Escola de Artes Visuais do Parque Lage) – Bia Amaral, Giodana Holanda and Tina Velho – and opened with the collaboration of the artists and teachers Fernando Lopes, João Velho and Maria Tornaghi. The center was re-inaugurated in 2006 under the coordination of Tina Velho, with the sponsorship of Oi and the Rio de Janeiro State Department of Culture tax incentive for cultural activities, as well as support from Oi Futuro and the Friends of EAV Association. In 2013, the NAT was ponsored by Embratel through the project "Modernization and expansion of the art equipment and technology EAV Parque Lage". 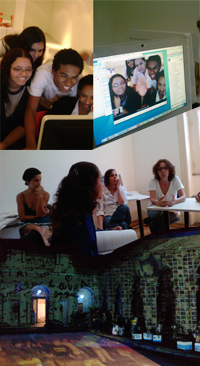 Distance art education course for students from public schools that are members of the Oi Futuro project, TONOMUNDO. The students take part in a collaborative project in conjunction with the Art and Technology Center at EAV (NAT_EAV) and a guest artist. The main focus is on the use of new communication technologies – virtual networks and mobile media – and how they influence our daily life and contemporary art. Art residency program for young artists at the Art and Technology Center at EAV. The aim is to encourage experimentation, development and research using the latest technologies, especially virtual networks and mobile media. 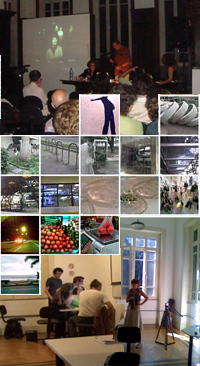 The main aim of this project, which has been running since 2007, is to investigate the relationship between urban networks and virtual networks, using them as a metaphor for the city and outlining new strategies for urban intervention. The works investigate the use of public space, and are organized collectively over short periods of time using combinations of sound, live images, video, performances using telepresence, and poetry produced in real time by the participants. Small-scale contemporary art exhibitions organized by NAT_EAV that are open to the public. The works focus on the use of new media, video, radio, performance and music, and the exhibitions are complemented by discussions with authors, producers, scholars and the public. Daily Life and Mobility is a group that aims to create narratives and map out daily life and experience in the city. The art work – interwoven networks of images and ideas – is created through an interchange of photos and videos shot using cell phones and created using keywords (tags) sent by text message via cell phones. The projects are inspired by some of the core issues of urban life.